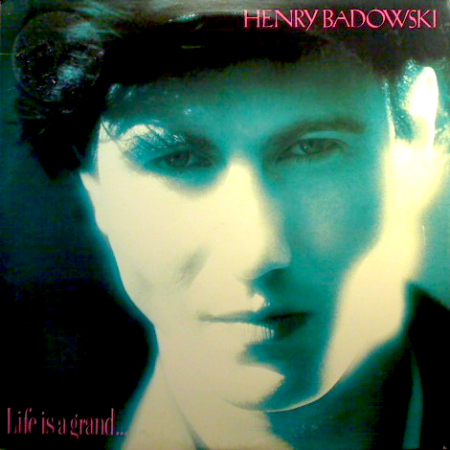 At least one writer has called Henry Badowski's Life Is a Grand "THE Great Lost Album of All Time." I have to agree; in my case literally, because while I once owned (and treasured) this record it now seems to have disappeared into a black hole in my house - all the more vexing because the cheapest used copy of this vinyl-only release now goes for $80 on Amazon! As the TulipFrenzy.com blogger put it, "Unless you had the vinyl, or paid up for it, you would have to take the word of people like me: this was about as close to the Holy Grail of record collecting as a modern power-pop fancier could get." So why am I looking for it now? Well, having recently seen The Damned's 40th Anniversary Tour when it came to town at the Baltimore Sound Stage, my wife and I started obsessing over all things Captain Sensible and pulled out his first solo album, Women and Captains First (you know, the one the Captain recorded with producer Tony Mansfield of New Musik fame that featured his surprise UK #1 hit version of Rodgers and Hammerstein's "Happy Talk"). Amy remarked that her favorite track on it was "Martha the Mouth," to which I replied, "Oh, that one shows the influence of his one-time bandmate, Henry Badowski. Sounds just like a track off of Life Is a Grand." "Martha the Mouth" is a great tune, by the way, but I never knew who or what it was about until I poked around YouTube and found this post by secretghostcode that claimed it was about Martha Beall Mitchell - wife of Nixon's Attorney-General John Mitchell! Martha made claims to the press that the White House officials were corrupt and engaged in illegal activities, as well saying that she had been drugged and held prisoner in an attempt to stop her talking. Her claims were dismissed as delusional, that she was suffering from a mental illness and that she was an alcoholic. However the Watergate scandal that followed proved much of what she had been saying to be correct. There is a psychologist term "The Martha Mitchel Effect" which is when a practitioner mistakenly perceives a patient as delusional by the patients extraordinary claims. One of the lyrics that I could make out is, "You know that I saw you on old Frosties TV show". It gave me the idea that Martha had appeared on The David Frost Show, which was correct, in 1974 she was interviewed by David Frost on the BBC. There's a video clip of the interview on the BBC website. As for the Captain Sensible-Badowski connection, well, Badowski was originally the bass player with punk band Chelsea (who famously abandoned lead singer Gene October to form Generation X with Billy Idol), who went on to briefly play with the Captain in the band King. King played five gigs in the summer of 1978 and recorded a John Peel session that resulted in their lone record, the four-track My Baby Don't Care EP. In fact, Badowski's IRS single "Baby, Sign Here With Me" (later also included on Life Is a Grand) was first performed by King and can be heard on that August 25, 1978 John Peel radio session (click here to download). According to the cool music blog Die or D.I.Y. ?, in King's set "...you can hear parts of Machine Gun Etiquette before the Damned reformed; like 'Anti-Pope' and the keyboard bit from 'I Just Can't Be Happy Today'..."
The Captain considered Badowski "a genius," and it's easy to see why. Like early synth-pop pioneer Badowski, Sensible would ditch his bass to broaden his musical palette, not only switching to guitar but adding keyboards to the Damned's repertoire. Before that, Badowski had also played with the Captain in the reformed Damned (1978's "The Doomed" - so named because Brian James retained the name "The Damned" until 1980 - where Henry replaced no less a legend than Lemmy! ), and had collaborated with Mark Perry in ATV and The Good Missionaries, Johnny Moped (where he met future collaborators violinist Alex Kolkowski and drummer Dave Berk), and Wreckless Eric (for whom he played drums!). Life Is A Grand came out in 1981, and in the States at least, was discovered by approximately three people. Happily we were one, and it brings a certain joy to tell you that just today, for the first time since the early Reagan years, we have dusted off the record, ascertained that our phonograph works, and put it on. It holds up! With just James Stevenson on guitar and bass, Badowski sang, played keyboards, programmed the drum machine, and played sax. The record is like a mix of Eno’s Taking Tiger Mountain By Strategy and Bowie’s Low –– though it is so endearingly sweet, you have to imagine Bowie on ecstasy, not blow. It is almost entirely upbeat, and the rhythm section could easily have been the Moxhams from Young Marble Giant — minimalist, spare — underneath Farfisas and simple keyboards. All we see of Badowski from the album cover is a fey, Bryan Ferry head of hair posed near a hedge on one of those great British country gardens. And that’s all we’ve seen of him for 30 years or more; he disappeared, at least on this side of the pond. And the record? It disappeared too. If today you heard on the radio “My Face,” which leads off the album, you’d think it was a contemporary band that owed a debt to Eno, which is never a bad thing. “My Face” was a minor British radio hit, but it’s “Henry’s In Love” that has kept spinning in our head for lo these many years, a gorgeous British pop song with a melody XTC’s Andy Partridge would have made too angular, would have stripped it of its languorous charm. “Swimming With The Fish In The Sea,” has a bass line programmed by Bach after one too many lagers and is another song that you’d swear was an Eno outtake; if I put it on and claimed it was the lost Eno single, “Seven Deadly Finns,” you’d take it at face value. “Silver Trees” sounds like it could have been sung by Wire’s Graham Lewis on a champagne bender. “This Was Meant To Be” is somewhere between Berlin Trilogy Bowie and Orchestral Manoeuvres In The Dark. Now, let us say, we are opposed to artists not getting paid for their work, and have never participated in illegal fire sharing. But there is no other way to get a digital file of this record. 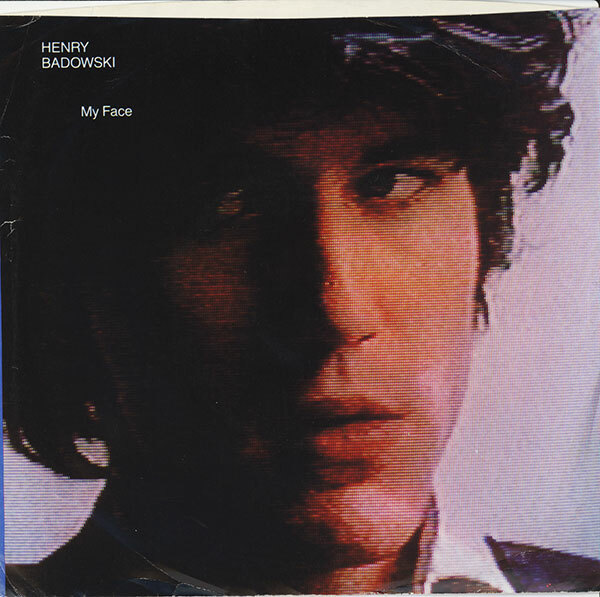 And we justify posting a link to the site where you can download the record thusly: we bet that, if Henry is not going to be able to get royalties from his 1981 masterpiece, he would want people to listen to it. To remember him. To recognize that he produced The Great Lost Album of the post-punk era. Happily, it’s lost no more. Click here to download Life Is A Grand. 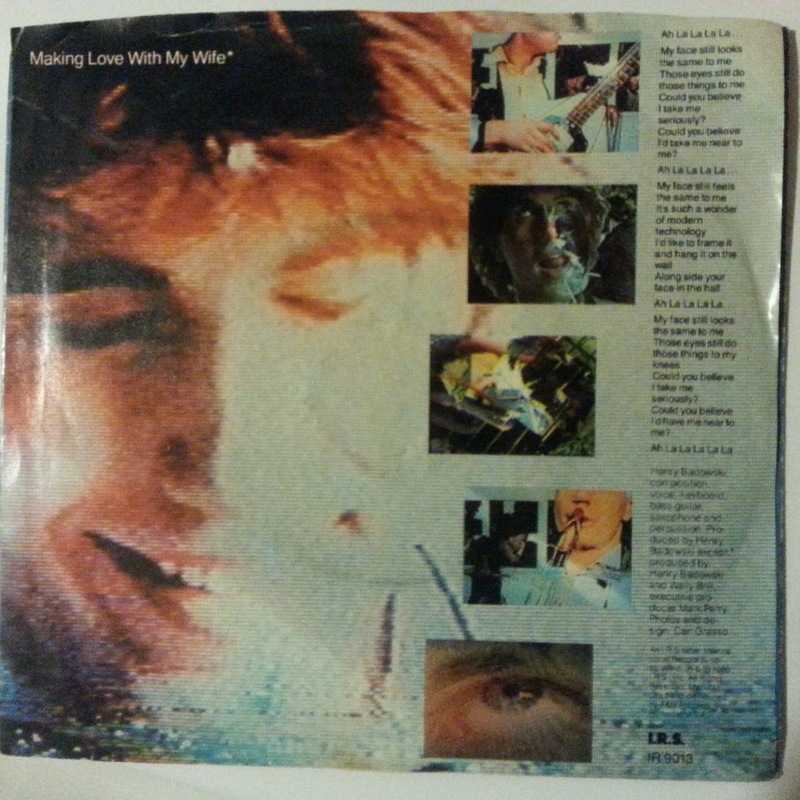 And - consolation prize- I still have my 1980 Badowski single "My Face," backed with the non-LP song "Making Love With My Wife"! Henry Badowski - "My Face" b/w "Making Love With My Wife"
This homage to marital monogamy (also re-released by IRS in 1981) is the same version that was originally released on the 1979 Mark Perry-produced Deptford Fun City single "Making Love With My Wife" b/w "Baby, Sign Here With Me" (as shown below). 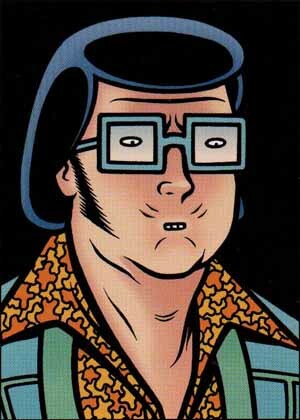 Badowski plays all the instruments on it. 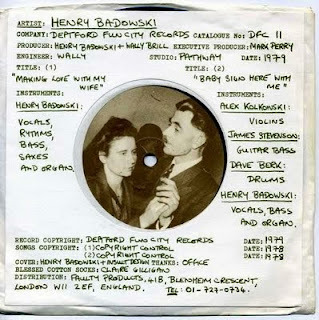 For more on Henry Badowski, check out the IRS Corner web page. I have this album and love it but what happened to Henry?